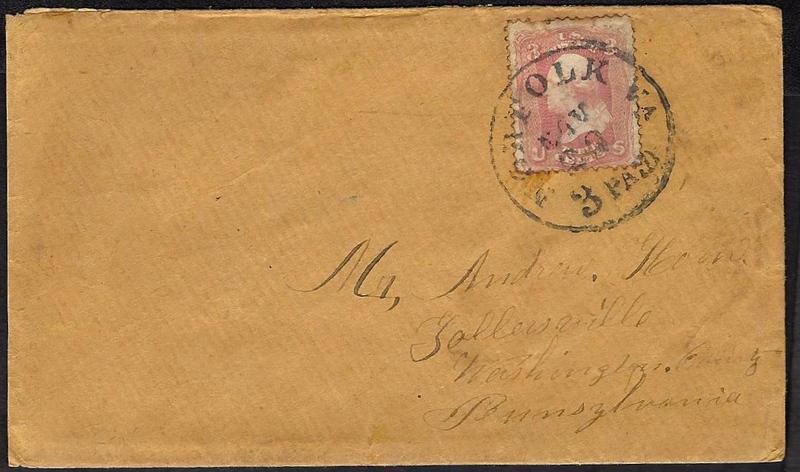 This letter was written by Private Jonas Horn (1823-1907) of Company D, 85th Pennsylvania Infantry. Jonas was discharged on a surgeon’s certificate on 24 November 1862. It is believed that Jonas Horn was the son of Jacob Horn (1786-1858) and his wife Mary (1784-1853). He wrote the letter to his brother Andrew Horn (b. 1825). There were several other soldiers in the same company by the name of Horn who were probably Jonas’ cousins. One of them, Hezekiah Horn, we learn, was wounded in 1862 though the particulars are obliterated by an excision of the patriotic engraving in the letterhead. 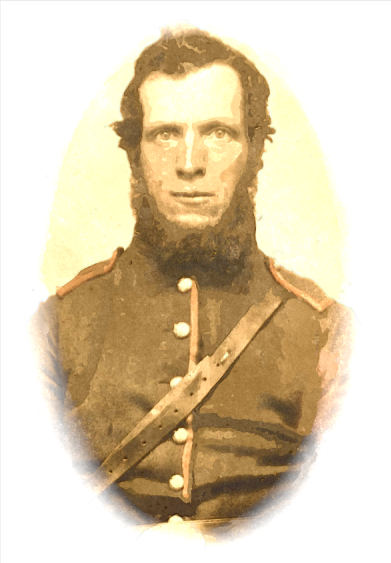 We know that Elias Horn was transferred to the Veteran Reserve Corps on 16 March 1864, probably after suffering a wound. The 85th Pennsylvania was organized in the fall of 1861 and served their time around Washington until March 1862 when they moved to the Peninsula and saw action at the Battle of Williamsburg and the Battle of Seven Pines (Fair Oaks). Horn’s description of his “narrow escape” came during the Battle of Fair Oaks when the Union troops were hit hard by Stonewall’s men. William H. Horn, the captain of Company D, was the son of George and Eleanor Horn of Zollarsville, Washington County, Pennsylvania. Capt. William H. Horn married Emily (“Emma”) Zollars in 1863. I send you a few lines this morning to let you know that I am still living and well, hoping that you may all read these few lines in good health. We had a narrow escape for our lives in the last battle. Our company was on picket when the rebels made the attack. We had to stand our ground till the enemy was within fifty yards of us. We was overpowered about ten to one and we had to give away. But he 85th stood their ground till they killed 480 of them and wounded four times that number while our loss in killed and wounded and missing will not exceed one hundred. There is different statements about Hezekiah [Horn] but I think from what I can [learn he] was wounded in the thigh [and is] now in the hospital in [?]. This is all that I can tell [?] at this time. I received [your letter] of the 9th and was glad [to hear] you are getting along [so well. It] is more than we can [say here]. We have a great deal of [sickness] at this time. We have Doctor ______ for our doctor and I think we will soon recruit up again for we have had no doctor for the last five weeks. Elias [Horn] has been sick but is now a getting well and will soon be able for duty again. We have had hard times since the battle for we lost all our clothes but what we had on our backs. I have but one shirt that I brought from home but we expect to draw soon. I would like to be at home to help with the harvest but that is out of the question so I will quit the subject. I give my pocket book to T. J. Hathaway ¹ when I left Camp Scott. He was sick at that time and has since went home and died at his father’s the 12th day of this month and I want you to go there and get it. There was twenty-five dollars in money in it and a note on Bowen Rees for thirteen dollars. His father’s name is Jacob Hathaway. He lives about a mile from Plumpsock in Morris Township on the creek above Amity. I would write oftener if I could get the stamps. I want you to write as soon as you find out about my pocket book and let me know if you got it and the contents. I will bring this to a close by saying that I still remain your affectionate brother till death. Adieu. ¹ Thomas Jefferson Hathaway (1833-1862) was the son of Jacob Hathaway (1801-1882) and Jane Powers (1803-1896). This entry was posted on Tuesday, September 2nd, 2014 at 3:08 am	and posted in Uncategorized. You can follow any responses to this entry through the RSS 2.0 feed.